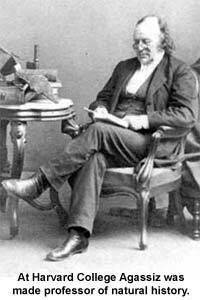 ouis Agassiz was a Swiss boy who knew how to keep his eyes open. Some people walk right by things without seeing them, but Louis kept a sharp lookout, and nothing escaped him. Louis was born in a small Swiss village near a lake. His father was a minister and school teacher. His mother was a fine scholar and was very sure that she wanted her children to love books, but two brothers of Louis's had died and she meant to have Louis and another son, Auguste, get plenty of play and romping in the fields so that they would grow up healthy and strong, first of all; there would be time for study afterwards. The Agassiz boys had a few short lessons in the morning with their father or mother, and then they roamed through the woods and fields the rest of the day. Of course they found plenty to interest them and never came home from these jaunts with empty hands. They had pet mice, birds, rabbits, and fish. There was a stone basin in his father's yard, with spring water flowing through it. In this Louis put his fish and then watched their habits. As I told you, nothing escaped his eyes. He proved this more than once. It was the custom in Swiss cantons for different kinds of workmen to travel from house to house, making such things at the door as each family might need. Louis watched the cobbler, and after he had gone away surprised his sister with a pair of boots he himself had made for her doll. And after the cooper had made his father some casks and barrels, Louis made a tiny, water-tight barrel, as perfect as could be. He kept his sharpest gaze on the tailor, and Papa Agassiz said to his wife: "Let us see, now, if Louis can make a suit!" They did not, in the end, ask him to try, but no doubt he knew pretty well how it was done. At the age of ten, Louis was sent to a college twenty miles from Motier, where his parents lived. He was keen at his lessons and asked questions until he mastered whatever he studied. The second year he went to this college he was joined by his brother, Auguste. The two boys liked the same things and never wanted to be away from each other. Whenever a vacation came, the boys walked home--all that twenty miles--and did not make any fuss about it! By and by the boys wanted to own books which would tell them about birds, fishes, and rocks. These were the things Louis was thinking of all the time. The boys saved every cent of their spending money for these books. They were always talking about animals. One day, as they were walking from Zurich to Motier, they were overtaken by a gentleman in a carriage. He asked them to ride with him and to share his lunch. They did so and talked to him about their studies. He was greatly taken with Louis, who was a handsome, graceful lad, as he told the stranger his fondness for books. The gentleman hardly took his eyes from the boy, and a few days later Reverend Mr. Agassiz had a letter from him saying that he was very rich and that he wanted to adopt Louis. He said he was sure that the boy was a genius. Louis was not willing, though, to be any one's boy but his own parents', and so the matter was dropped. The boys did not have much spending money, and it took, oh, such a long time to save enough to buy even one book! So they often went to a library, or borrowed a book from a teacher, then copied every word of it with pen and ink, so as to own it. You can see from this that they were very much in earnest. When not studying or copying, the brothers were busy outdoors, watching animals. In this way they learned just what kinds of fishes could be found in certain lakes, and almost the exact day when different birds would come or go from the woods. In their rooms the cupboards and shelves were crammed with shells, stuffed fishes, plants, and odd specimens. On the ledges of the windows hovered often as many as fifty kinds of birds who had become tamed and who made their home there. At seventeen Louis was bending over his desk a good many hours of the day. He learned French, German, Latin, Greek, Italian, and English. But he was wise enough to keep himself well and strong by walking, swimming, and fencing. Because Louis's parents and his uncle wanted him to be a doctor, he studied medicine. He carried home his diploma when he was twenty-three and earned a degree in philosophy, too. But in his own heart he knew he would not be happy unless he could hunt the world over for strange creatures and try to find out the secrets of the old, old mountains. Louis traveled all he could and became so excited over the different things he discovered that he sometimes stopped in cities and towns and talked to the people, in their public halls, about them. He had a happy way of telling his news, and crowds went to listen to the young Swiss. The King of Prussia thought that any one who used his eyes in such good fashion ought to visit many places. He said to Louis: "Here is money for you to travel with, so that you may find out more of these strange things. You are a clever young man and can do much for the world!" In the course of his travels, Louis Agassiz came to America. At that time he could not speak English very well, but all his stories were so charming that the halls were never large enough to hold the men and women who wanted to hear him. Louis Agassiz loved America so well that he made up his mind to spend the rest of his life here. As time passed, he decided, also, to give this country the benefit of all that he discovered. He was so bright that the whole world was beginning to wonder at him. France got jealous of America's keeping such a great man. So Napoleon offered him a high office and great honors; but Louis said "No," adding courageously: "I'd rather have the gratitude of a free people than the patronage of Emperors!" The city of Zurich begged him to return. "No," he wrote, "I cannot. I love America too well!" Then the city of Paris urged him to be at the head of their Natural History Museum, but this was no use, either. Nothing could win Louis Agassiz away from America. At Harvard College Agassiz was made professor of natural history, and there is to-day at Cambridge a museum of zoology, the largest of its kind in the world, which Agassiz founded and built. At his home in Cambridge the professor still kept strange pets, quite as he used to do when a boy. Visitors to his garden never knew when they might step on a live turtle, or when they might come suddenly upon an alligator, an eagle, or a timid rabbit. The precious dream of going to Brazil came true when Louis Agassiz was fifty years old. With a party of seventeen and his wife, he went on an exploring expedition to South America. It was a great adventure. Agassiz had been to many cold countries and had slept on glaciers night after night, with only a single blanket under him, but never in his life had he been in the tropics. When Agassiz arrived in South America, Don Pedro, the Emperor of Brazil, was glad to see the man who was known as a famous scientist and heaped all kinds of honors upon him. Better than all, he helped Agassiz get into many out-of-the-way places. If you want to know about a fish that has four eyes, about dragon-flies that are flaming crimson and green, and floating islands that are as large as a school playground, yet go sailing along like a ship, bearing birds, deer, and wild looking jaguars, read: A Journey to Brazil by Professor and Mrs. Agassiz. When you have heard the story of all these strange things, you will agree that Louis Agassiz did certainly know how to keep his eyes open.